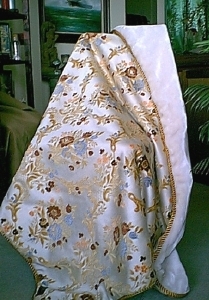 This is the Empress lap robe. 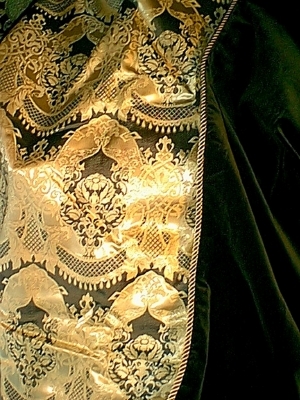 It features a rich, raised floral brocade in gold and brown tones and is lined with luxurious, deep-pile brown mink faux fur, imported from France. The Empress is finished with a beautiful braided cord in gold. 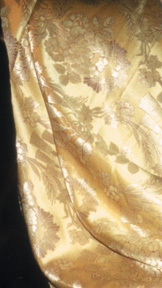 Versailles has an elegant gold on gold pattern. 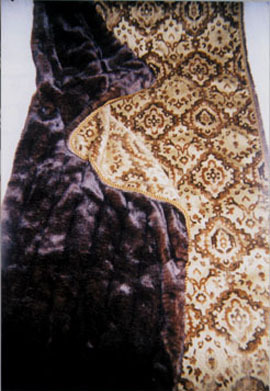 It is lined with soft, brown faux sheared beaver fur. 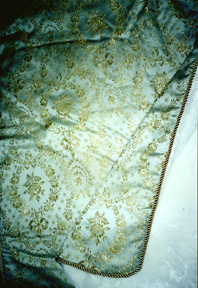 An intricate brocade in gold on a field of moss green is lined with a solid moss green velvet. Sparkling gold and snow white faux fur are combined in the Royal festival lap robe. A field of beige is filled with beautiful embroidered flowers in tones of gold, brown and pale blue. It is lined with soft faux fur in eggshell white. A pale green field is decorated with Gold Wreaths. 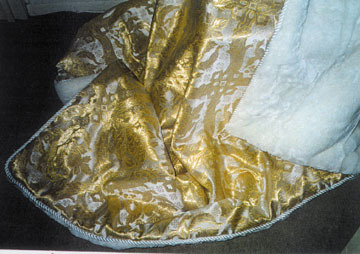 The lap robe is lined with soft, white faux fur.